Danny O'Sullivan was a drug addict by the age of 18. At 13, he tried cannabis, he took ecstasy at 14, was on cocaine and the legal high M-Kat at 15 and by his 20s was spending up to £1000 a week on drugs. Danny's story is not unusual, but the reaction to his recovery was. 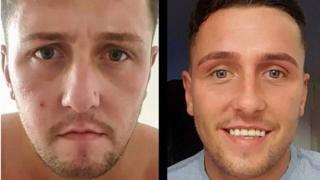 A selfie he posted to mark a year clear of drugs went viral with more than ten thousand people sharing the snap of his healthy, smiling face next to the haunted photo of Danny's lowest point 12 months earlier. In his own words, he was "broken, beaten and not wanting to live anymore" and had to reach rock bottom before he could climb back up. The first image showed Danny in Glasgow's Leverndale Hospital after he was sectioned due to multiple overdoses. The second showed a smiling Danny one-year drink and drug free. Now he has become an inspiration for others to change their lives. Sharing his turnaround with BBC Radio Scotland's Kaye Adams programme, Danny, from Renfrew, said: "I'd been trying to stop drinking and taking drugs for a few years, going to meetings and stuff but I could never get past 30 days sober and every time I went back out and took drink and drugs again it was progressing and getting worse and worse. "I overdosed three times in two months. I kept waking up from blackouts, waking up in hospitals, waking up in places I didn't know where I was. I woke up and I had smashed every window in my house and couldn't remember doing it. "I was suicidal and didn't want to be here anymore." At that point, Danny was spending up to £1,000 a week on drugs, owing money to dealers and knowing he could not pay it back. But he wasn't what people might think of as addict. He was functioning in a decent well-paid job. He said; "I was working as a centrifuge operator and making good money and that was financing what I was doing. But I was going into work and hadn't slept for three or four days and I was driving, backing lorries under conveyor belts under the influence. I had no regard for other people's safety or myself, I was really selfish and self-centred. "I was a danger to myself and everyone around me. The way I was acting, the people I was hanging about with. It was addiction. You could probably get a gram of coke dropped off faster than a pizza." Danny found himself at a crossroads in a psychiatric hospital. He said; "I got to the point where I didn't want this for my life. I had a few options. It was going to be jail, hospital, death or recovery. Danny said he hit rock bottom but he needed to do that to start his journey back. He started a six-month rehab programme with the charity Turning Point where he learned how to function without alcohol and drugs. After a year clear of drugs, Danny posted the before and after photos on social media. He was blown away by the reaction. He has been bombarded with requests from families of addicts desperate for their loved ones to do what Danny has achieved. He said: "People that are contacting me saying their loved ones are struggling and asking for advice." Danny says he tries to lead by example now. He fears alcohol is the biggest danger to young people. He explained: "Alcohol is definitely the gateway drug because your inhibitions are lowered and you may take something if you were offered. Alcohol is the biggest problem of them all. "I have a young sister of 15 and I know what it's like at that age, the peer pressure. "But drugs are just as readily available today as alcohol. You could probably get a gram of coke dropped off faster than a pizza." "The only thing I can do is be a good example by doing the right thing and maybe someone will do the right thing because they see me doing that." Details of organisations offering information and support with addiction are available at bbc.co.uk/actionline, or you can call for free, at any time to hear recorded information on 08000 155 947.